On June 13, 2015, Noble Resources International (Pte) Ltd emerged as the lowest bidder in the competitive bidding process to supply coal to the Lakvijaya Power Plant in Nuraichcholai, Puttalam. On June 29, before the tender had been formally awarded to Noble Resources, Swiss Singapore Overseas Enterprises (Pte) Ltd, which had come in the 5th place after the bidding process, had written to the Standing Cabinet Appointed Procurement Committee (SCAPC) which had opened the price proposals for bids, calling for a re-evaluation of its bid. This resulted in the Technical Evaluation Committee (TEC) which appraises all tenders, being ordered to re-scrutinise the tenders by the SCAPC, disregarding two vital criteria that had been previously imposed with regard to the size of the coal. 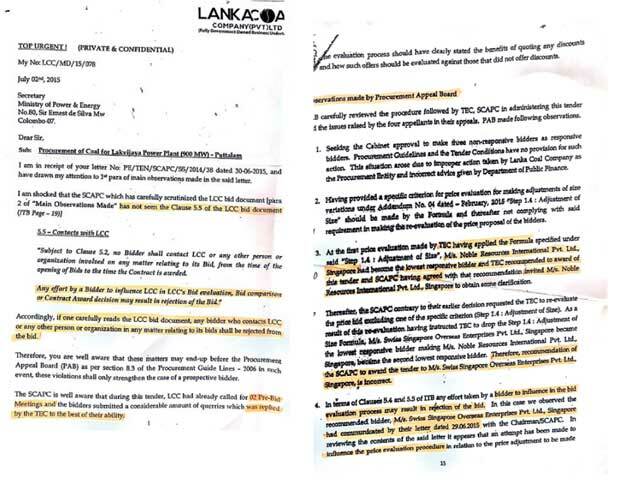 On July 2, Gunaratne, then Chairman of the LCC, had written a letter to the Secretary of the Ministry of Power and Energy, Dr. B. M. S. Batagoda highlighting clause 5.5 of the LCC bid document which prevented any bidder from contacting any organization involved with the bidding process, from the time of the opening of the bids. “This is a Secretary to a Ministry who would have sat on a million tender boards so he should have been able to see this. I had a very good relationship with Batagoda and this was the first time I saw him taking this route. After my letter he bitterly complained to the Minister upon which the SCAPC decided that I was interfering with the process and wanted to get rid of me” said Gunaratne. Irrespective of the letter, a few weeks later the tender was awarded to Swiss Singapore. 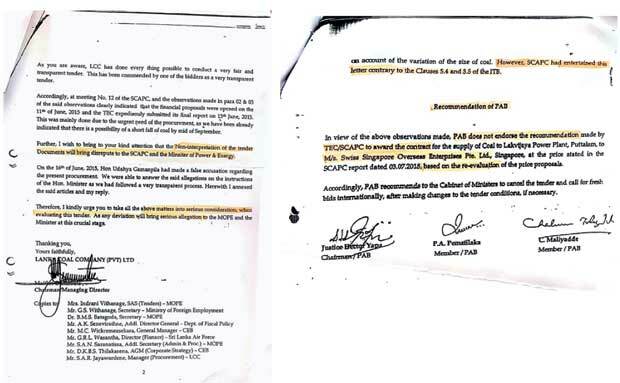 4 of the 6 bidders then appealed to the Procurement Appeal Board (PAB), which hears appeals by bidders, and the PAB’s observations included the fact that Nobel Resources was the lowest responsive bidder, that the awarding of the tender to Swiss Singapore was incorrect and that the SCAPC had entertained a letter from Swiss Singapore which was contrary to the LCC bid document as it “appeared that an attempt had been made to influence the price evaluation procedure”. The PAB recommendation was for the Cabinet to cancel the tender and call for fresh bids. “This is a direction I have got with the discretion given to me to terminate the contract. 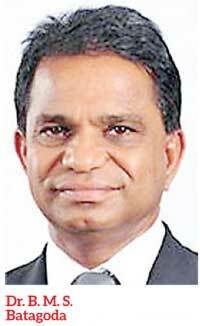 The reason why the Supreme Court has given me this discretion is that if I were to cancel it immediately and there were ships that were sailing already with the coal for us it is unfair to them”, said Gunaratne. When the judgment had come out Maithri had brought it to the notice of the Board which had wanted clarification from the Supreme Court. According to him, Batagoda had then taken over the entire operation and had proceeded to send the judgment to the Attorney General for a decision. “We come under the Ministry so Batagoda may be CFO but we are an independent organization tasked with procuring coal for the power plant. I couldn’t do anything when he took it all over because I come under the Secretary himself. I can’t fight them every step of the way and I also couldn’t be seen fighting with them always since I am appointed by the President. 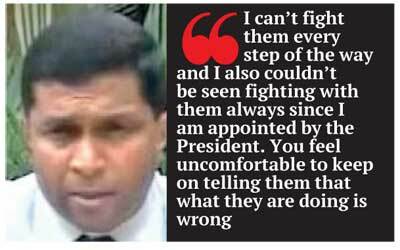 You feel uncomfortable to keep on telling them that what they are doing is wrong,” Gunaratne said. However, instead of the AG himself, the Additional Solicitors General (ASG), Sanjay Rajaratnam President’s Counsel, who was also counsel for 58 of the named Respondents in the Supreme Court case, had interpreted judgment and deliberated on it. It was Rajaratnam’s opinion that if Swiss Singapore filed for damages there would be an opening for a damages suit. “So in October 2016, I was called for a meeting at the Ministry with Batagoda and Swiss Singapore. Batagoda’s questions to them were as follows’ “If we don’t give you the contract you will sue us won’t you?.” Swiss Singapore’s reply was, “Yes we will.” Another question of his was, “Then if you sue you will ask for damages won’t you?.” To which the reply was again in the affirmative. So it is extremely clear that Batagoda wanted this. I am surprised at the manner that the ASG conducted himself. He had no right to interpret judgement since he was representing respondents. Either he is dishonest or he is corrupt.” said Maithri. When Rajaratnam was contacted by the Daily Mirror he said he couldn’t comment on the issue and that any response had to come from the AG. The ASG had then instructed the parties to get Cabinet’s opinion on “this already warped opinion.” This was opposed in the Cabinet by Minister Champika Ranawaka and a few others however it was hurriedly put to the Cabinet Economic Sub-Committee. “The seal was then put on it and it came back to me as a Cabinet decision. So even though there is a Supreme Court judgment when it comes as a Cabinet decision I have to follow that since I am appointed by the President”, Gunaratne explained. Therefore the tender went ahead with Swiss Singapore for one million tonnes of coals at a price of USD 90-92 per tonne, whereas according to Maithri it was possible to purchase it at USD 80 in the open market. “Consumers cry when the electricity bill comes. We need to work at bringing it down, not for a few officials to be getting money. When I was at the LCC I was able to supply the full requirement to the power plant. An operation cost of Rs. 40 per metric tonne was brought down to Rs.17. A residue of bottom ash was used to make blocks of stone. None of these projects were to the liking of Batagoda. The LCC team was better than any private organisation so much so that 4 international bidders wrote to me commending it as the most transparent conduct they have been part of.” When asked about his future plans in tackling this issue Gunaratne said that he would be consulting his lawyers to see if his Fundamental Rights were infringed upon since under Art. 26 of the Constitution we are all bound to protect resources of the country. Allegations have been made by UNP MP Nalin Bandara that the loss from the coal procurement tender is incorrect. However when the Daily Mirror contacted the Auditor General’s office, it defended the report by stating that the loss was calculated by the documents provided by the LCC and the Ministry. “According to the Procurement Guidelines the criteria cannot be changed for evaluation” said Assistant Auditor General E. A. G. Ananda. "Consumers cry when the electricity bill comes. We need to work at bringing it down, not for a few officials to be getting money. When I was at the LCC I was able to supply the full requirement to the power plant. An operation cost of Rs. 40 per metric tonne was brought down to Rs.17"
However, Batagoda was unavailable to answer any questions with regards to the letter or to explain his actions throughout the process. 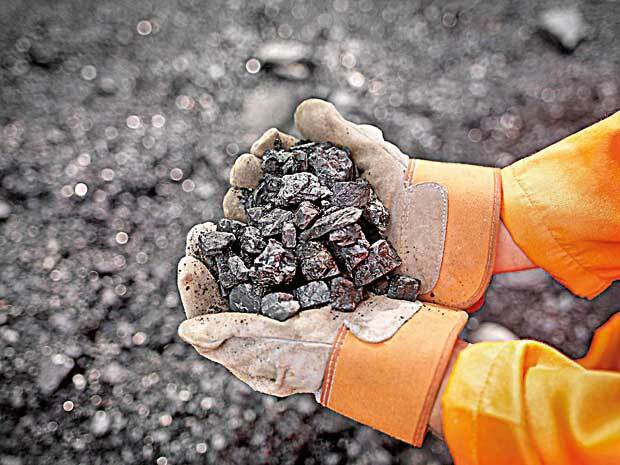 Swiss Singapore will be supplying coal until April and would have in total supplied two sets of one million tonnes of coal by then. The issues are as follows. Why did the SCAPC entertain a letter by Swiss Singapore, in violation of the tender rules and order the TEC to re-evaluate the bid? Why were the PAB recommendations unheeded? Why was the discretion given to the Chairman of LCC taken over by Batagoda? Why weren’t the directions of the Supreme Court given any weight in the Cabinet Economic Sub-Committee action? And most importantly, leaving aside the right and wrong of this debacle, if one is dissatisfied with the lowest bidder what is the logic behind skipping 2, 3 and 4 to award the tender to the 5th? The answers should be contained in ‘Good Governance’ but maybe only time will tell.